What can I say. This is a wall. Originally a very dull one. The place, somewhere in Barcelona. Another play with colors and textures. Hope you like my stone wall. Ooh, maybe you can send your photo to the city council — who knows, they might decide to really paint the stones. What fun that would be! A technicolour wall. Terrific. Brilliant and vivid colors. A very artsy wall! Fun, bright colors! 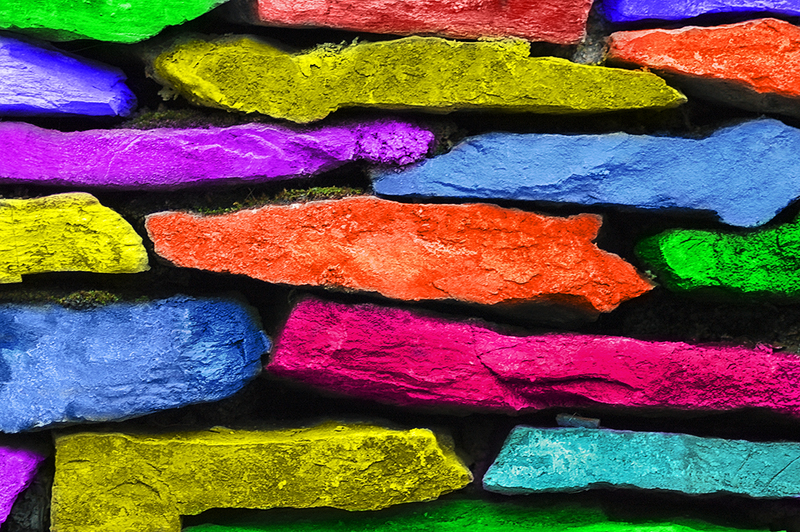 O my I've never seen such a colourful dry stone wall. This is such a beautiful take. Great colors. It is a fun picture. If only more people were as creative with plain, ordinary objects, what a much more colorful world it would be. Great shot! Were the colours as fluorescent in real life, or have you enhanced them after taking the picture? Diste vida a las piedras, es un arco iris pétreo.